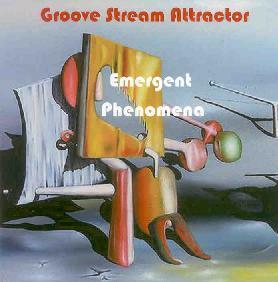 Groove Stream Attractor - "Emergent Phenomena"
Groove Stream Attractor is a quartet based in the Chapel Hill, North Carolina area, three of its four components being members of the excellent Smokin Granny, a band I've written about several times in Aural Innovations. The band consists of Todd Barbee on saxophones and Yamaha WX7 (I believe that's the midi wind controller), Jeff Lindsey on percussion, Brian Preston on fretless bass (all from Smokin Granny), and Ted Johnson on synthesizers. One of the comments I've repeatedly made about Smokin Granny's music is that Todd Barbee's midi horn often plays a keyboard role, which has much to do with the distinct character of their sound. So when I saw that a synth player would be teamed up with his magic horn I was most curious to hear the results. The CD includes 3 tracks totaling about 29 minutes. "Jurassic Moon" and "Gulf Stream" are the two shorter tracks. On the former, the bass and synths work together to create spacey atmospherics, as the bass (serving double duty) and drums set a slow groove. Barbee's horns only makes a brief appearance, though I wouldn't be surprised if some of the keyboards were actually him. "Gulf Stream" is a jazzy tune with Barbee accompanying himself on both sax and Yamaha. Cool jazzy music with an ambient feel. The two opening tunes were ok, but the real highlight is the 18 minute "The Obelisk". A rolling bass and steady percussion lay the foundation for a synth jam that creates a spacey/proggy feel. But when Barbee kicks in on the horns Soft Machine comes immediately to mind, though with a spacey atmosphere that the Attractors can call their own. I really dig Preston's fretless bass which is playing simple lines but is powerful in the deeeeeeep winding sound each commanding note creates. Barbee's unmistakable horn sound brings in shades of Smokin Granny. And Johnson really shines on this track, his synth style adding to the groove aspect of the music, but giving a powerful space-ambient feel as well. Which is interesting to hear because as smokin as it is, the Granny's latest release, Tarth Shooke, included some ambient moments as well. So clearly these guys are exploring a special interest. The track does have it's slower moments, but overall it's cosmic groove music for the mind and soul. I hope to hear more. For more information you can email Groove Stream Attractor at: meta4ik@mindspring.com. CLICK HERE to read the review of Smokin Granny's Tarth Shooke CD that appeared last issue.